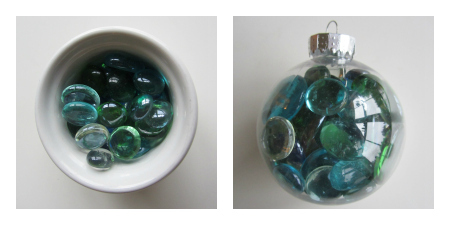 Time is short during the holiday season and these ornaments took no time at all to fill. 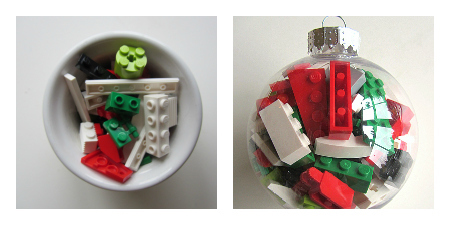 The fun part for your kids is to find things that fit through the hole at the top to fill the ornaments with. As you can imagine, we have a lot of craft supplies that we have gathered over the years and me being me I save everything to use again. 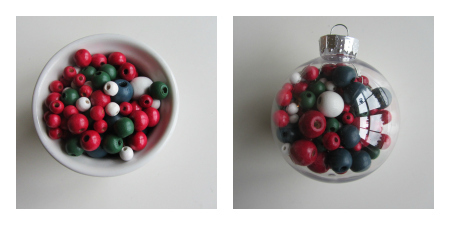 Having a bunch of ornaments and different fill in a craft buffet would be super fun activity for a holiday party. 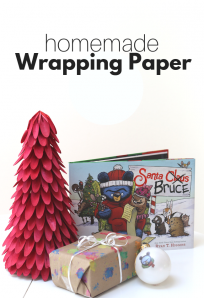 I like the idea of using these as an alternative to wrapping too. All you really need are some clear plastic ornaments waiting to be filled. 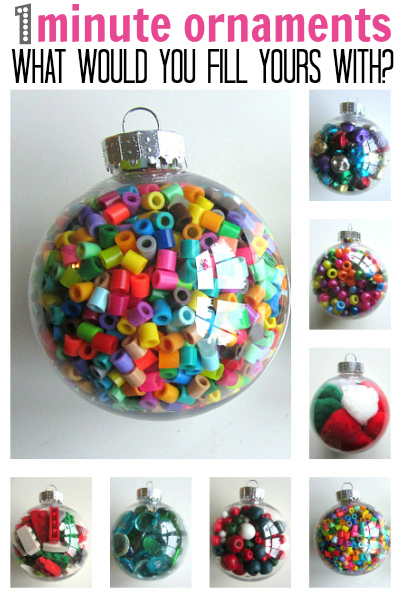 Fuse beads were so colorful and would make a cute stocking stuffer as is. The glass beads reflected the light so well. 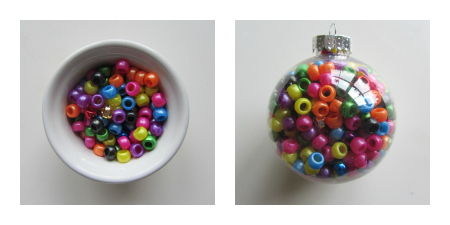 These wood beads would fit right in with our rustic holiday decor. These pony beads could be packaged with a jewelry box and some beading thread as a whole jewelry themed gift. The pom poms were fun for my toddler to help me put in. Additionally, they make a great unbreakable ornament for a tree for a young family or someone with cats! 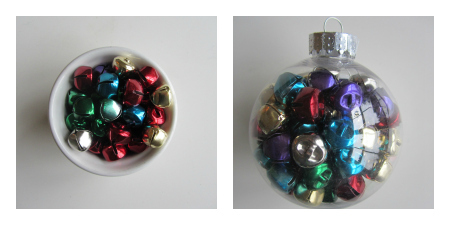 The jingle bells not only looked great, but also had a beautiful and a little muted jingle to them. It goes without saying that the LEGO one was my son’s favorite. I think it might be mine too. 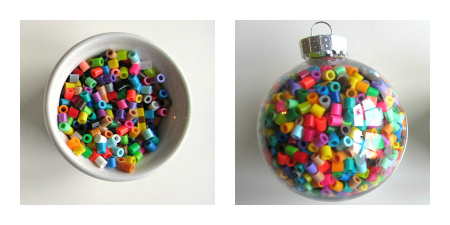 What would you fill your empty ornaments with? 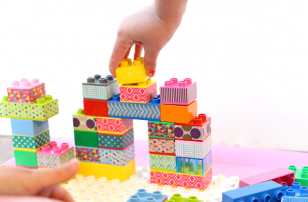 LOVE the LEGO idea! 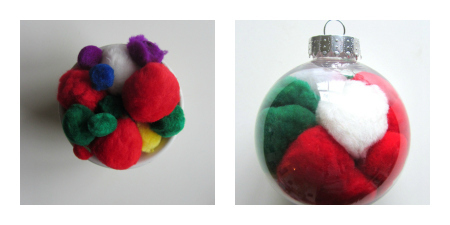 I just posted about a filled ornament we made with my daughter’s preschool. So fun! Sooooooooooo cute. I love this! I love it! And the possibilities are endless – buttons, yarn pieces, ribbons, confetti, cake sprinkles, fake berries, flowers, fake snow, shredded paper, M&Ms, colored rice, lentils !! That sounds so cool! I love tha M&M idea. This is great! 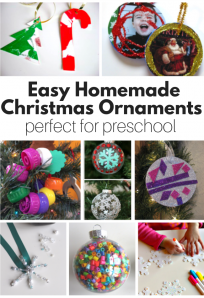 This is probably a silly question, but where do you find plastic ornaments? I have only seen the glass kind. I got them at Walmart in the kids craft section. I have also seen them at Dollar Tree and on Oriental Trading. Hobby Lobby and Michael’s had them! If you have a Hobby Lobby in your area try finding them there. They are putting Christmas out now. Last year they came in a light blue box. If you are unable to find any try the craft dept. They will be in a white box with a black band on it, either at the top or the bottom of the box. If they are not on a table in the main aisle try the aisle that mason jars on it. Good luck! I saw the plastic balls at AC Moore today. They were bigger than the ones shown and they also had a “flattened” circle shape that was thinner than a full ball shape. I think it would use less items to fill but would still be pretty. I personally like the tiny pompom balls with tinsel sticking out of them. Made one last year of Barbie shoes… I think it was more for me than for my daughter. With so much competing for their time, she didn’t play with them much….but I sure did when I was younger! How about sand and some tiny seashells. What a great idea! The possibilities for just that are endless! I never even considered seashells. Thank you! I bought a tone of these a few weeks ago and we used part of them for our ornament to go home and the other part for a math activity! 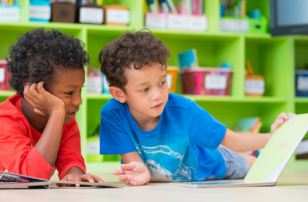 I love this idea too – my class would love just filling them with toys! Pretty bath salts! Plain Epsom salts or table salt could give them a snowy effect. 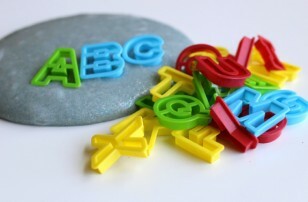 OR color some Epsom salt black/grey….coal for a someone on the “naughty list”. OR…add a few pieces of black Epsom on top of a layer of plain salt and add a bit of an orange colored something to create the melted snowman look. Thanks for the inspirations. take out — CAUTION Very hot!… let cool… tip out unpopped seeds…tie ribbon on top… so cute! For the deep South: rice in the bottom third, red beans in middle, tiny bottle of tabasco on top! Too cute! So cute!! I’m from Louisiana and my homies back home would love this!! 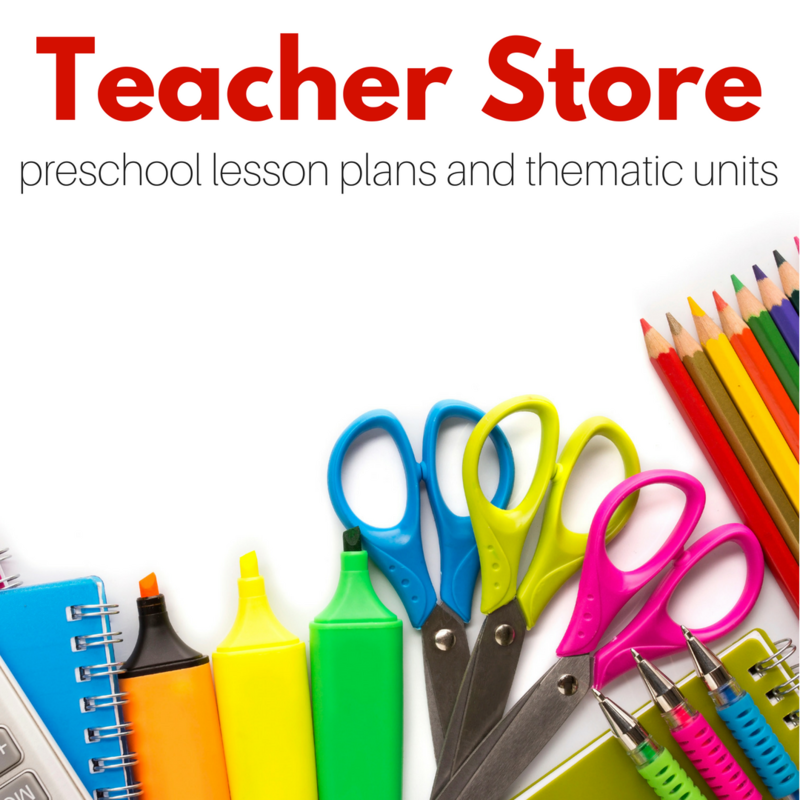 Cute & easy for little hands. My only concern is the flat marbles would be far to heavy. Mine kept together fine but it was heavy. 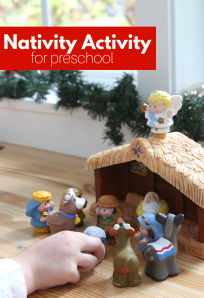 My church kids made these with strands of garland to put inside and we used glue and epsom salt (I think) on the outside too, just in some places, like do lines of glue and then roll in the salt or something! But these are AWESOME ideas!!!! I think the lego one might also be my favorite, or the commentor who put barbie shoes in! I also enjoy the pony and pearler bead ones. Who am I kidding, I love them all!! this a really cool idea. I really like it….thank you! Where can I get the balls please? I got then at Walmart last year and have already seen them there this year. 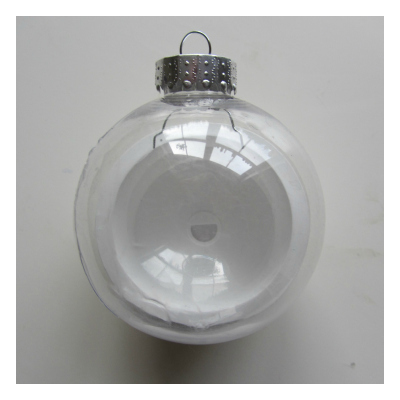 were did you buy the clear plastic ornaments ? I made one of these with silk rose petals from my wedding. Flower girl still had them! I like the perler bead one here. I think translucent pony beads would be cute. Or fill it up with cheap plastic rhinestones for some glitzy glitter. Old fashioned Christmas tinsel, the silver stringy kind would also be full of bling. Get the kid to write what they want for Christmas on small slips of colorful paper, then fold them up and put them in there. Christmas wish confetti. Write the date on it and you have a holiday time capsule to look back on later. I bought lego men, put them together and filled each ornament with 5 lego men. Filled another with hershey kisses.